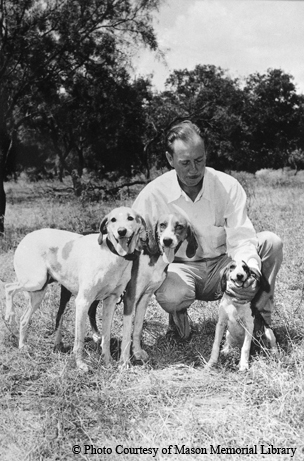 ﻿﻿﻿﻿Looking back at 'Old Yeller' and Texas author Fred Gipson. I vividly remember reading Old Yeller by Fred Gipson as a 10- or 12-year-old. Gipson’s descriptions of killer javelinas and wild hogs instilled a fear that has never subsided. The thought of rabid animals veering through my yard sent shivers up my spine. I nodded my head in understanding at Travis’ irritation with his pesky younger sibling. And while I did not have a dog, I could appreciate the strong bond between Travis and Old Yeller. But the final scene, when Travis was forced to make a terrible decision to keep his family safe, left me in tears and awe. As a kid, could I make such a heart-wrenching decision, and then follow through with it? In my heart, I was pretty sure I would fall short at such a moment. With an avid 12-year-old reader in my house now, I have been exploring young adult fiction in the past few years. I decided to reread Old Yeller. Forty years later, these elements of the story still stand out, but the book’s setting and details make the story more remarkable for me now. Gipson fills every page with facts and descriptions of the Texas Hill Country. Set in the years following the Civil War, the book portrays a beautiful and bountiful countryside filled with danger and challenges to overcome. Travis then reflects on the ethics of shooting and injuring a creature. Descriptions of bat caves, prickly pear flats, raccoons stealing corn, herons nesting in trees while catfish lurk in pools underneath, and the intricacies of cow, dog and hog behavior can have been written only by someone who had spent many hours hunting, fishing, exploring and observing. A native Texan born in 1908 and raised on a ranch near Mason, Gipson helped his parents and siblings bring in crops and put food on the table, according to his biography, Fred Gipson, Texas Storyteller, by Mike Cox. Often in the evenings, the family sat on the front porch telling stories about hunting, fishing and animals. Dogs were always a part of Hill Country native Fred Gipson's life. It should come as no surprise that Gipson had dogs growing up, including one called Old Misery, who seemed to have one character trait in common with Old Yeller, according to Cox: a penchant for stealing food. Gipson took his dogs so seriously that his mother was concerned that he would grow up to be just “a hound-dog man.” She needn’t have worried. Some of Gipson’s outdoor education came from trailing after a bachelor neighbor named Charlie Sanders, who was the inspiration for his first novel, Hound-Dog Man. Gipson hunted raccoons and deer, and spent a great deal of time fishing. After graduation from high school, Gipson worked as a cowboy, a bookkeeper, a mule-skinner and a road construction worker. With the advent of the Depression, it became increasingly difficult to make a living. After seven years of scraping by, Gipson decided to enroll at the University of Texas at Austin, where his younger brother was a student. In his freshman English class, he began putting his country stories down on paper with some success. The next year, he enrolled in journalism courses, and in 1935, his first published story appeared in the UT student newspaper, the Daily Texan. He left UT in 1937 for a job with the Corpus Christi Caller-Times, and spent the next three years traveling Texas, observing and writing about its people and ways for the Harte-Hanks newspaper chain. Along the way he met and married a San Angelo girl named Tommie Wynn. Shortly after their honeymoon, and with his wife already pregnant, Gipson was fired. Instead of tracking down another job, he decided to embark on a freelance writing career. The couple retreated to his family’s ranch near Mason. Before too long, he began selling Western stories to magazines, able to bring authenticity to the stories by drawing on his knowledge of Texas history and culture. Gipson’s first book was published in 1946, a biography of Col. Zack Miller. Several novels followed, including Hound-Dog Man. His first children’s book, The Trail-Driving Rooster, came out in 1955. But it was his second children’s book that sealed Gipson’s place in literary history. In the fall of 1955, Gipson sent a query letter to his publisher pitching a book about a boy and his dog, based on a story told to him by his grandfather, Cox says. Gipson felt that most children’s books of the time were too sweet, and needed a dose of realism. His story would “show life as it was and not as people thought it should be,” Cox writes. Gipson received the go-ahead. 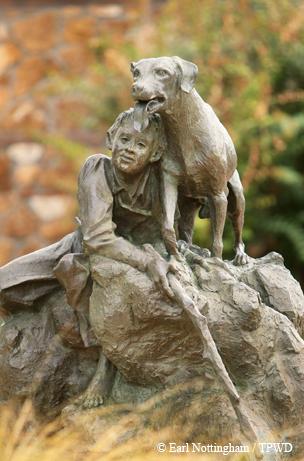 A statue of Old Yeller and Travis sits outside the Mason library. The book, originally titled Big Yeller Dog, took three months to complete and was received enthusiastically by both his agent and publisher. Disney bought movie rights before the book had even hit the bookstores, and on-paper profits were over $100,000. Gipson was 48 years old. The Disney folks hired Gipson to help write the script for the movie, his first screenwriting gig. He flew out to California to work, but was homesick, in ill health and unhappy there. He couldn’t wait to get back home to Mason. Disney studio staff tried to make changes to the story, most notably to the ending. They thought it was too harsh. Walt Disney, who had been monitoring the progress of the script, decreed that the movie would end like the book. According to Gipson’s notes on the screenwriting experience, he added a runaway mule scene to replace the book’s bull-fighting scene, which would be too difficult to film. Old Yeller was played by a dog named Spike, who was found at the Humane Society. A close viewing of the movie reveals pine trees where there shouldn’t be any; the movie was filmed primarily in California, before the days of the Texas film industry. All told, Gipson published 12 books (some posthumously), 150 magazine stories and many newspaper columns, along with book reviews, screenplays and television scripts. Everything he wrote reflected his roots in the Texas Hill Country. His was a unique gift: the ability to accurately and humorously portray the feel of a place and its people. People all over the world saw an accurate picture of rural life in Central Texas after the Civil War through his telling of a simple and universal story — the story of a boy and his dog.